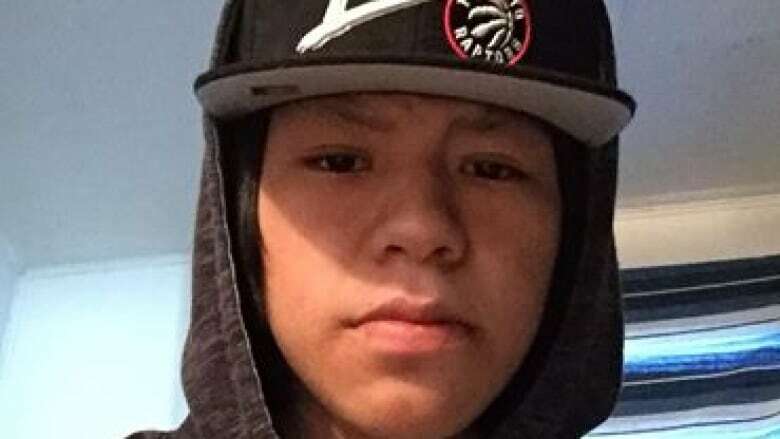 A deputy grand chief with Nishnawbe Aski Nation says the family of the 17-year-old boy whose body was found in a park in Thunder Bay, Ont., this Sunday, is "in shock" and are "very hurt." "I can't even begin to imagine how they are feeling right now," Derek Fox told CBC News. "I've lost people in my life but to lose a child and grandchild is something that people should not experience in their lifetime." Police released a written statement on Dec. 10 saying they are investigating a sudden death in the Chapples Park area. The body was identified as that of Braiden Jacob by members of his community after he was found in the south-side park just after 11:30 a.m.
Jacob was reported missing after he was last seen in the Limbrick Street area on Dec. 6. Prior to that, he was seen at about 9 p.m., the day before at the Victoria Inn on Arthur Street. Fox said he spent Sunday evening with Jacob's grandmother to support her. He said the teen was in the northwestern Ontario city from his home community of Webequie First Nation for medical reasons. "He was trying to get some help for his personal issues," Fox said, adding that the teen had to come to Thunder Bay as "there's no services like that where he lives." Minister of Indigenous Services Jane Philpott tweeted her condolences after it was confirmed that the body found on Sunday was Braiden Jacob. Fox said the leadership of the Nishnawbe Aski Nation (NAN) is "appreciative" that the federal minister reached out, however, "at the same time, we are looking for action and we're looking for solutions." "I think Minister Philpott reaching out is a start, but something needs to happen and it's going to take a strong collaborative effort from everyone to seek solutions," Fox said. "I love our home city, this is where a lot of our people come to make a life for themselves, I love Thunder Bay ... my family loves Thunder Bay but I don't think anyone can pretend that things are fine." NAN Grand Chief Alvin Fiddler also expressed his "heartfelt condolences to the family and friends of Braiden Jacob and the community of Webequie First Nation," in a written release on Monday. "We prayed for his return, and are saddened with the news we received last night that has confirmed our worst fears," Fiddler stated. "Nothing can lessen this tragic loss, but we hope that a thorough investigation will reveal the circumstances around his disappearance and help prevent similar tragedies." On behalf of city council and the citizens of Thunder Bay, Mayor Bill Mauro also offered his "deepest sympathies and heartfelt condolences" to Jacob's family and the community of Webequie First Nation. "Thunder Bay grieves with you," Mauro stated in a written release issued Monday. "We would like to thank everyone who took part in the search for Braiden including the volunteers and members of the Thunder Bay Police Service. We are saddened beyond words and stand with you at this most difficult time." Police have been holding the scene since Sunday and are asking the public to stay away from the Chapples Park area where the teenager's body was found. The local force said Monday afternoon that the body has been sent to Toronto for a post-mortem, which is tentatively scheduled for Dec. 12. Police said they expect to know more after the autopsy.